Slipper-like comfort, easy-to-use Boa dial and a good weight-to-stiffness ratio make the new Fizik R5B shoes a really good buy at £130. They offer much of the performance of a high-end race shoe without depleting your funds quite as badly. They look really good too, and with shoes that's important to many people. 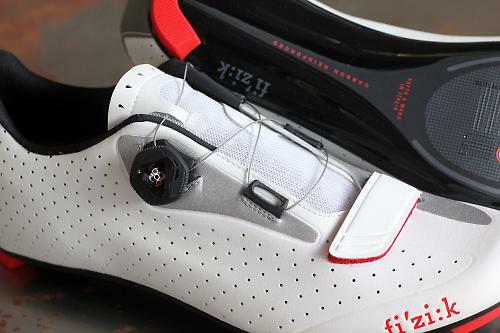 Fizik's new R5B shoes go with a Boa dial (that's what the B in the name stands for) over the Velcro strap arrangement of the original R5, and the result is a much improved fit that is easier to dial in on the move. You can still buy the original R5 if you prefer, but I'm betting most will find the Boa dial easier and nicer to use. The Italian company previously majored in saddles but has built quite a following for its footwear since branching out into shoes in 2012. The R5B shoes are their most affordable road shoes and share much of the technology and features, and definitely the style, of the more expensive shoes in the range, but a few material differences makes them a lot less pricey, with very few drawbacks. The main visual difference with the new R5B, and the more expensive R3B, is that two of the three Velcro straps have been replaced by a Boa IP1 dial. There's still one Velcro strap over the toe box, providing a fit-and-forget adjustment. The Boa mechanism uses a steel lace that is looped over the top of the shoe and tensioned by an easy to use dial. The adjustment is fine enough to get just the right amount of pressure with the lace pulling the shoe tight over the top of the foot. My early concerns about the spread of the pressure proved unfounded . I'd worried that the single Boa dial, compared to the twin dial arrangement on some shoes, might not evenly spread pressure, but these are very comfortable shoes with no uneven load across the top of the foot. Even with the Boa dial tightened excessively, the load is evenly distributed. The best thing about the Boa dial, and why it's my preferred closure system, is that it's very quick to use. It can be adjusted easily on the move, and you can even adjust it when wearing overshoes, something you clearly can't do with velcro. You can release the pressure, and loosen the shoe, by rotating the dial in the opposite direction with the same level of micro-adjustment. To remove the shoes, the Boa dial 'pops' up, releasing all the tension. Visually the R5B has a lot in common with the much more expensive R3B (those will set you back £215). The R5B shoes are constructed from a Microtex upper with laser perforated dots scattered liberally across the top and sides, which will likely provide a bit of ventilation in the summer, but give the shoes a smart appearance the rest of the time, breaking up the white finish. The heel is finished with a large panel of reflective material. 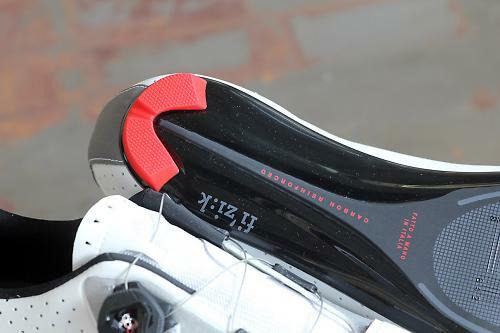 That's a really nice touch compared to the usually tiny patches of reflectivity you get on most road shoes, and there's more reflective material along the front of the shoe too. Underneath the shoe is a carbon-reinforced nylon sole. 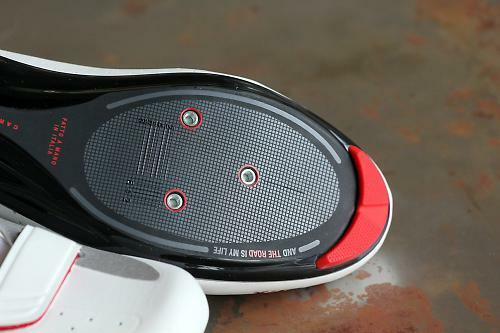 That's the key difference between the more expensive R3B, which gets a carbon fibre sole. My size 45 shoes weigh in at 301g each, which is actually lighter than the Giro Factor ACC Road shoes I reviewed earlier. Those are quite a bit more expensive too. The Boa dial does save a fair bit of weight then. A difference that can be noticed with the nylon sole is a small amount of flex when you push really hard on the pedals. However, it's a minute degree of flex and you really have to be looking for it, and most of the time they felt just fine. In fact, this proved to be a positive trait as they were extremely comfortable, compared to some carbon road shoes I've tested in the past that are uncomfortable due to the extreme stiffness. More stiffness isn't always a good thing. There are the standard three cleat holes with a good range of fore-aft adjustment. Setting up cleats (Speedplay in my case) is made easier with horizontal and vertical numbered markers, and the a grid covering that entire cleat zone. That makes lining up left and right shoe cleats a cinch, and completely removes the guesswork sometimes involved with achieving a symmetrical cleat setup. Comfort and fit is where these shoes really impressed me. I can rarely slip on a new pair of road shoes and find them immediately comfortable, but that was certainly my experience with the R5B shoes. The shoe hugs my foot nicely, the tongue helps to evenly spread the pressure from the Boa dial lace system, there's no heel lift. They're just perfect, really they are. So, highly impressive comfort and fit to match the best shoes on the market, great looks, generous reflective details, easy Boa dial adjustment, lightweight '' there's a lot to like here. All this performance comes at a price well below the top-end shoes you'd expect to have to buy to get this this level of performance. For all but the most demanding cyclists, these are an excellent choice. ALL NEW R5B: Built with perforated Microtex, they feature a carbon reinforced outsole and Boa IP1 closure system for a great fit and pedalling efficiency. Okay they're not as stiff as many carbon fibre shoes, but unless you're a very demanding racing cyclist, you probably don't need all that stiffness, and these match the task set by most road cyclists just fine. Very good, I've used countless Boa dials on road and mountain bike shoes for years and never had one fail yet. Score really well considering their price. Perfect, really, what more is there to say. For out of the box fit and comfort, these are unmatched. £130 is still a lot of money for a pair of shoes but considering just how impressive these shoes are, the pound-to-performance ratio is very appealing. Flawless performance, easy to setup the cleats, Boa dial is a cinch to use, it's all good. Really like the styling, and the reflective details are a nice touch. A bit of flex is discernible at times, but for general riding the slight lack of comfort is actually a positive attribute. If you want stiffer, the R3B's have a carbon sole. With great fit, comfort and easy Boa adjustment, and a competitive weight, these are a really good choice in the £100-150 road shoe market. Only the slight amount of flex slightly lets them down. Yep they're both white, how dare they! The thing I like about my Sidis (and was actually part of the purchase decision) is no hook and loop fastenings ('velcro'). 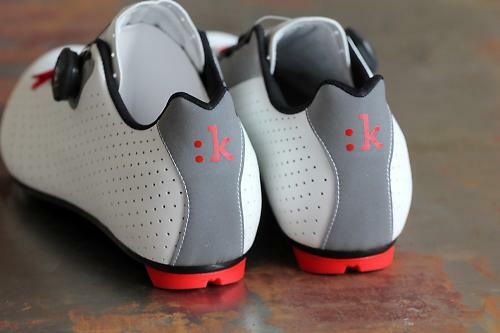 Are these really better than the B'TWIN 700 carbon road cycling shoes which weigh less @ 460g/pr and still cost £50 less? I manged to get the Original 3 Strap R3 Uomos on sale for £130. Think they're still available on probikekit. I followed Fizik's size guide that said a UK 8 was a 43, so a size larger than normal, does this fit with your experience?